With the weather warming up, chances are you’re getting ready to enjoy your swimming pool – or maybe you’re just starting to think about putting one in. But whether you’ve had your pool for years or it’s still in your dreams, a vinyl pool fence is the perfect way to keep your pool safe and secure. According to Dallas law, every in-ground pool and any above-ground pool less than 48 inches tall must be completely surrounded by a fence. The law says nothing about what kind of fence you must have, though. Whether you want it to be wood, metal, vinyl, or anything else, it’s OK as long as it meets the minimum requirements. That isn’t to say that all pool fences are created equal – far from it. The fact of the matter is that vinyl fences offer superior durability and a longer lifespan than other kinds of fences, and they look better too. Pool fences need to be durable. 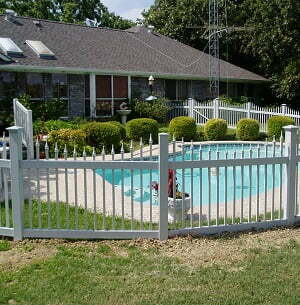 Unlike privacy fences and decorative garden fences, pool fences get a lot of abuse. We hang our towels on them, splash them with pool water, and open and shut the gates dozens of times a day. Your pool fence needs to be able to stand up to both constant use by you and your family, and constant exposure to sun, rain, and other weather. That’s why vinyl is the perfect material for a pool fence. Unlike wood and metal, vinyl doesn’t deteriorate over time from exposure to sun, rain or normal use. Wood fences swell and shrink when they get wet or dry, and metal fences like chain-link can rust over time. Vinyl is the only product that keeps 100 percent of its strength for its entire lifespan. Another advantage of vinyl is that it keeps its appearance just as well as it keeps its strength. Vinyl fencing doesn’t fade in the sun, doesn’t stain from water or rust, and doesn’t need to be painted or otherwise protected. This makes it great for pool fencing – after all, you already have enough maintenance to worry about with taking care of the pool itself. Why would you want to add your fence to that list? At Future Outdoors, we can install a great, high-quality vinyl pool fence in your yard at the lowest prices you’ll find anywhere in the greater Dallas area. All of our pool fences feature code-specified safety features including self-closing and self-locking doors and correct height and spacing requirements. Plus, they’re far stronger and more durable than wood or metal fences, meaning once you have it you’ll have it forever! Call Future Outdoors today to get a free quote on your vinyl pool fence, or follow us on Facebook and Google+ for updates and special offers.